The 8 sisters of The InterOrganization Network (ION) released their 2006 surveys of "the magic number" -- the share of women on corporate boards of directors. While Catalyst Inc. has been conducting such surveys of the Fortune 500 firms since 1995, several dispersed women's leadership advocates have begun conducting their own research. Trying to compare the results of these two groups was confusing at first. If Catalyst's Fortune 1000 average in 2004 was 13.8%, why was it that everyone else was so low? 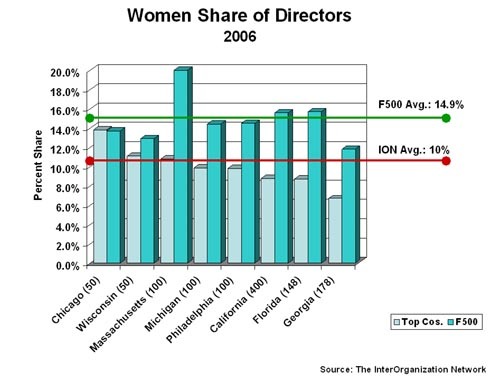 The chart, below, shows the comparative data with a red line indicating Catalyst's Fortune 1000 share of women directors. 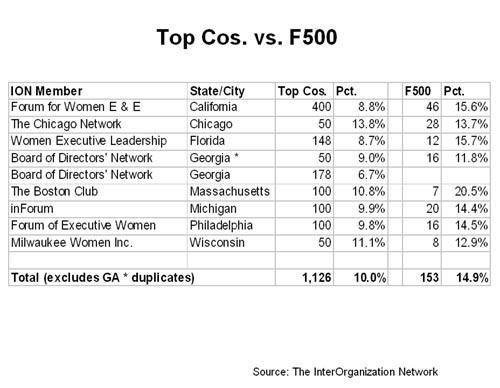 We looked first at the geographic distribution of Fortune 500 and 501-1000 sized firms across the country. The ION group states were not the largest in terms of number of firms per state. Only California ranked among the top states. After that, among the ION group, IL ranked 4th in the number of Fortune 1000 firms, Pennsylvania was 6th, Michigan was 9th, Georgia was 10th, Florida was 11th, Wisconsin and Massachusetts were 16th and 17th. Three states with the most Fortune 1000 firms were NOT among the ION groups: Texas, New York and Ohio at second, third and fifth. For the first time, in 2006, all 8 groups surveyed their firms at the same time, although they did not all survey the same number of firms per state. The groups chose to include seven times as many smaller companies (1,126 firms) than Fortune 500 firms (only 153 companies) which were located in their states. This larger number produced an average that is almost 5% points LESS than that reported by Catalyst Inc. which covered just the top Fortune 500 firms. 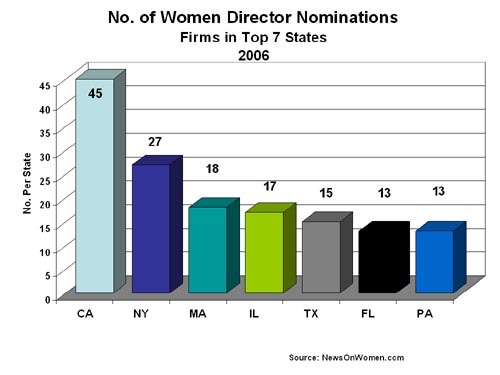 Generally, there is a tendency of larger firms to have higher shares of women directors. 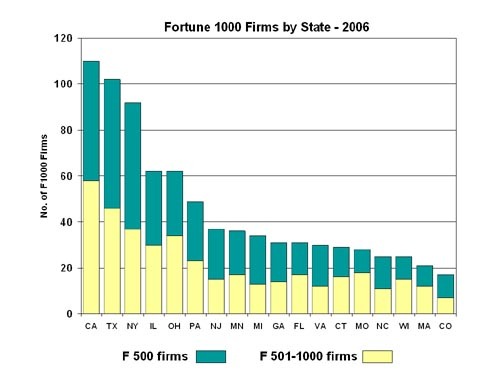 Looking at the Top 50 and Top 100 firms in a state, rather than the Fortune 500 or Fortune 1000 shows different results. Assuming 100 women were added to the boards of directors on the 153 companies among the Fortune 500 firms in the 8 states, the result would be a 6.5% improvement in the share of women on boards (assuming the average board size at that level is 10 members). If the same 100 women were added to the boards of directors of the 1,126 smaller firms tracked by the ION groups, that would result in only a 1.1% increase (where the average board size is probably closer to 8). The result would be even worse if average board size were larger. 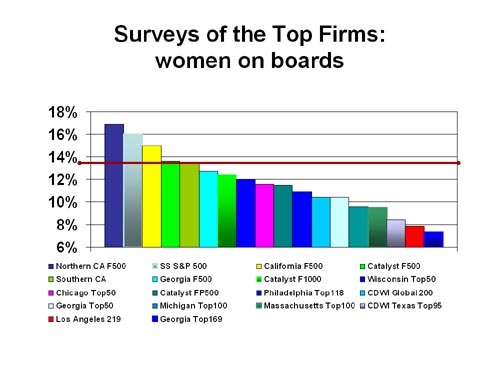 The chart below contrasts the average reported by ION states vs. Catalyst's average share of women directors covering the Fortune 500 firms, nationwide. The graphic shows that each region's larger sampling has a lower average share of women directors than was the case with the Fortune 500 firms within those same states. The comparative data is presented in the table below the graphic. Why would the ION groups focus on the bigger number of firms and the smaller share of female directors? By presenting the lower average scores, the "bad news" is exacerbated, the newspapers pay greater attention, and more "Action Required!" imperatives can be espoused. If 8 organizations keep singing the same chorus, it must be true. Catalyst Inc. does a similar thing by reporting the "bad news" from their surveys of the Fortune 500 firms. 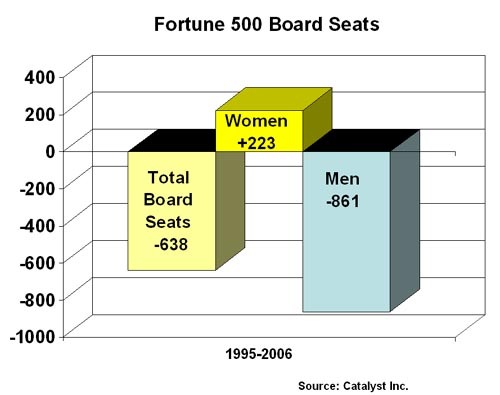 Catalyst's 2006 census bemoaned the "bad news" that women held "only 14.6%" of the director seats at Fortune 500 firms, "down from 2005." The reality is that women directors lost a whopping .09% over last year, resulting in a net decline of 4 director seats. More "ACTION REQUIRED!" The change in the percentage shares and the absolute numbers of women directors needs to be put into perspective. One cause of that precipitous drop could have been the merger of Golden West Financial into Wachovia, resulting in the elimination of 5 women-director seats. This year was another year of major mergers, acquisitions, and consolidations among the top Fortune 500 firms as shakeout occurred on many economic fronts. Another important reality is that boards have reduced their board size dramatically, tightening up on director headcount, responsibilities and committee roles. 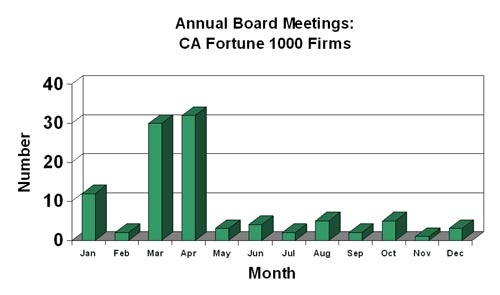 The chart below shows the drop in average board size over the past 11 years, using Catalyst's reported data. 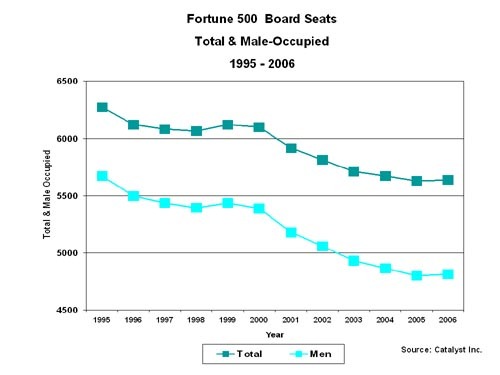 It shows that reductions have occurred in both total board size and in the number of men on board since 1995. 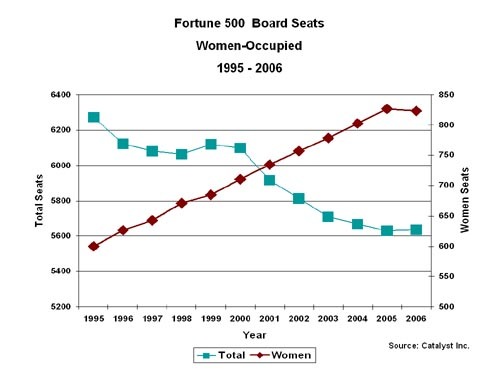 Now contrast that graph with one that shows the growth in the number of women on boards at Fortune 500 firms, on the right axis, versus the decline in total board size, on the left axis. True, the scales are different, so to see the net comparative differences, we update the chart showing the overall impact over 11 years for the total board seats, male-occupied seats and female-occupied seats. Women are ahead by 223 seats compared to men who have lost 861 seats. Mergers and acquisitions have trimmed the available supply of board seats, and boards themselves have reduced their average board size. Directors have been aggressively pursuing female talent to serve on top Fortune 500 boards, even to the extent of replacing men. Does this mean that "Action NOT Required??" Not at all. It does suggest that women are finding many new director opportunities at smaller, more entrepreneurial and new technology firms. This is affirmed by the press release announcements throughout 2006 from NewsOnWomen.com. There were more women added to corporate boards of directors of all sizes in 2006 (278) than the total net increase in the number of female directors at the Fortune 500 over the past 11 years (223). But that good news is hidden when you only look at "the magic number" -- the share of women directors as a percent of the total. New York, Texas and Ohio also are important states (not included in the ION groups) to track in the progress of women named to corporate boards. But, in any event, it would be nice if all states could begin with the Catalyst data, then show a consistent number of additional, smaller firms so that we could monitor real progress at these two different groups. For some women even in 2007, a seat on a major public board at the Fortune 500 sized firm might be too big a leap of faith and risk on the part of the many talented women who aspire to corporate board roles. Many women recognize the challenge and opt to test their metal in the next tier of Fortune 500-1000 sized firms or even in firms smaller than those. That is a good strategy for managing risk as one undertakes a board role for the first time. Female director candidates are taking the right "action required!" as they pursue public corporate board opportunities. Take another look at the results from The Chicago Network's 2006 survey of the Top 50 (for-profit) Corporations vs. the Top 35 Nonprofits. 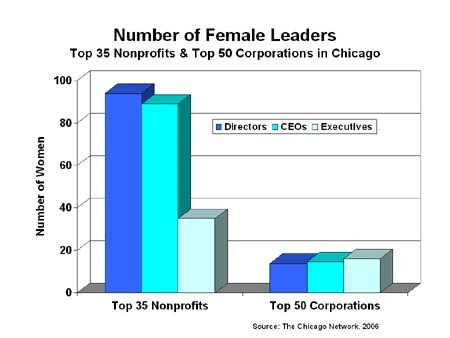 From the looks of it, a lot of women in Chicago have followed their advice, "get thee to a nonprofit board." But, that advice apparently has not trained or prepared the very large number of women to serve on for-profit boards of directors. Have the ION groups learned from this research? Are they pursing the right course of action to help women advance to leadership positions? Since we're expecting corporate, for-profit boards of directors, their shareholders and investors to take action to bring women on board, wouldn't it be appropriate to use a for-profit, shareholder or investor strategy? Isn't that what shareholder meetings are about? what proxy meetings are all about? what investor resolutions are all about? Therefore, wouldn't it be smarter for women advocates who want other women to advance to board roles to learn more about how the shareholder nominations and committees work? March and April are the two busiest months in terms of stockholders meetings, so we should not be surprised if there are somewhat fewer women director nominations and announcements during those two months. Nominating and Governance Committees are likely to be meeting in the 2nd and 3rd quarters of the year, when we would expect more announcements and press releases about new women added to their boards of directors. If women want to ensure that women are part of the leadership of our corporations, they will need to "get into the game" and figure out how governance works and how boards work. Just like any other shareholder or investor.